Spider Crab camouflage technique. Shot captured in the wild in the Mediterranean Sea (Italy) by 3CCD camera - PAL system. sd00:22Spider Crab camouflage technique. Shot captured in the wild in the Mediterranean Sea (Italy) by 3CCD camera - PAL system. hd00:34Sea marine snail glitters in sun underwater lagoon of ocean on Galapagos. Amazing life of tropical nature world in blue water. Scuba diving. hd00:11Underwater inhabitants on background of amazing seabed in Maldives. Unique video footage. Abyssal relax diving. Natural aquarium of sea and ocean. Beautiful animals. 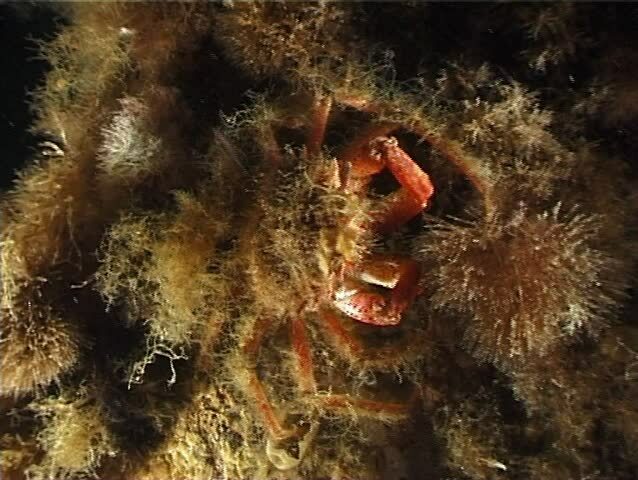 hd00:27Bristly crab, hairy crab (Pilumnus hirtellus). Fauna of the Black Sea.